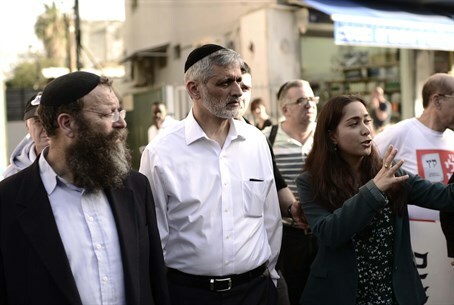 Members of Eli Yishai's Yachad - Ha'am Itanu party and Baruch Marzel with members of his Otzma Yehudit party took a tour of southern Tel Aviv on Sunday, where they surveyed how the massive influx of illegal immigrants from Africa has impacted the neighborhood, which suffers drastically raised crime levels. During the visit, which was guided by Otzma Yehudit member May Golan, who is chairperson of the "Hebrew City" movement and a longtime champion of Jewish rights in the area afflicted by infiltrator settlement, the group came across infiltrators who openly said they were in Israel illegally and were unapologetic about it. During the trip, Arutz Sheva spoke to Marzel, who explained that before Ha'am Itanu and Otzma Yehudit formed a technical bloc joint list, Yishai and former MK Dr. Michael Ben-Ari separately "led the battle" against infiltrators. "We came here to say we're devoted and committed to continue the battle till the last illegal resident from Africa will (go) back to his home in Africa," said Marzel. When asked about allegations of "racism" being leveled by leftist sources against the struggle with illegal immigration, he remarked "if saving the state of Israel from millions of Africans coming in and destroying the state of Israel is racism, that is the problem of (those) saying it. I'm fighting for the existence of my country." Despite the claims of African infiltrators being "refugees," the Israeli government has long provided figures showing the overwhelming majority are not refugees but rather work migrants. Likewise, detailed research from Denmark revealed Eritrean immigrants do not warrant refugee status by any definition. Golan, who was tenth on the Otzma Leyisrael list in the previous elections, posted documentation of the visit on her Facebook page and wrote "notice what we came across today during the visit - Eritrean infiltrators who shamelessly admit that they are infiltrators." "Eritrean infiltrators - in the guise of 'refugees' - who have enough money to pay income tax," wrote Golan. "Eritrean infiltrators who say clearly - 'this isn't your country and home' (to Jews - ed.). Infiltrators who learned how to use the concept of 'democracy' in order to lie. Eritrean infiltrators who tell us what sets the law here and tell us what we need to do."